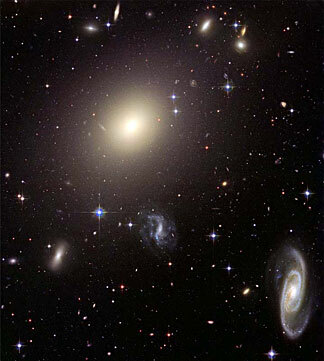 Ezequiel Treister, a postdoctoral fellow at the University of Hawaii, and Priyamvada Natarajan, a Yale astronomy researcher, found that ultramassive black holes, which lurk in the centers of huge galaxy clusters like the one at left, seem to have an upper mass limit of about 10 billion times that of the sun. Overeating has consequences even for ultramassive black holes that feed on material from gas, dust and stars, University of Hawaii and Yale University astrophysicists have discovered. "Evidence has been mounting for the key role that black holes play in the process of galaxy formation, but it now appears that they are likely the prima donnas of this space opera." "Ultimately, they stunt their own growth," says Ezequiel Treister at the UH Institute for Astronomy. Monster black holes appear to stop growing when they are about 10 billion to 20 billion times the mass of the sun, Treister and Yale Astronomy researcher Priyamvada Natarajan found in a recent study. "They get too big," Treister said in an interview, explaining an ultramassive black hole "keeps eating material, and when it's doing that - we call it a 'self-regulation method' - material is falling out. All this radiation is blowing away material so it cannot keep eating." Evidence for an upper limit on the biggest objects in the universe is being reported by Treister and Natarajan in the Monthly Notices of the Royal Astronomical Society. They studied existing optical and X-ray data of ultramassive black holes and found "they shut off at every epoch in the universe," Natarajan said in an Institute for Astronomy news release. Once thought to be rare, black holes are known now to exist throughout the universe and can grow to super-large masses. Black holes termed "ultramassive" have masses a billion or more times that of the sun, the astrophysicists said. Natarajan said their findings could have implications for galaxy formation since many of the largest galaxies appear to develop with black holes at their centers. Every galaxy, including the Milky Way, appears to have a black hole "tightly coupled to the mass of stars in the central region," Treister said. The Milky Way's black hole, called Sagittarius A, contains about 4 million times the mass of the sun, according to astronomy studies. Black holes start out as "small seeds and grow with time by feeding on gas" that is eventually replenished as galaxies merge, Treister said. A collision of two big galaxies with black holes also can create one super-huge black hole, he said. "But that is very rare. It can only happen two or three times over the lifetime of black holes." Other growth control mechanisms have been suggested for black holes, including one by Natarajan during doctorate work at the University of Cambridge. She said black holes might reach a point where they radiate so much energy as they consume everything around them that they end up interfering with the gas supply feeding them, and that might interfere with star formation in the region. "Evidence has been mounting for the key role that black holes play in the process of galaxy formation," Natarajan said, "but it now appears that they are likely the prima donnas of this space opera." Treister said black holes could play "the starring role in galaxy formation by providing the switch that turns all the action off and, as a consequence, stunt their own growth. "The next frontier is to understand better the physics of the formation of the earliest black hole seeds in the universe in order to figure out who came first, the first stars or the first black hole seeds." Treister recently joined the Institute for Astronomy with a Chandra X-ray Observatory postdoctoral fellowship. He was previously at the European Southern Observatory in Chile, where he said most of the research was done. He said he will use Chandra X-ray data to study the life of super-massive black holes for the next three years.